AMD is about to release its Bulldozer and Llano Fusion Platforms next month at Computex 2011. Many new details and charts have been revealed which show comparisons and performance demonstration of the chips. 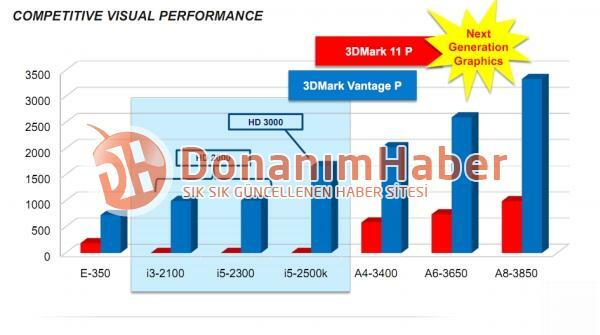 Well, Another set of charts have been revealed thanks to donanimhaber which show the graphics performance of AMD Llano Fusion A-Series APU’s (Accelerated Processing Units). According to the chart, All APU’s will support DX11 graphics, OpenGl, OpenCL and UDV 3.0 technologies. The fastest A8-3830 features a Radeon HD 6550 series chip consists of 400 Stream Processors providing upto 325% performance increase over Intel’s 2nd Generation Sandy bridge Processors which come with HD3000 Graphics. We also reported that the “A8-3850” would feature a clock speed of 2.9Ghz here. Similarly, The A6-3650 comes with a Radeon HD 6520 embedded solution consisting of 320 Stream Processors providing a performance increase of 200% while A4-3400 featuring Radeon HD 6410 (160 Stream Processors) provides 100% Performance increase over Sandy Bridge in 3D Mark Vantage (Performance Preset) and 3D Mark 11 (Performance Preset). 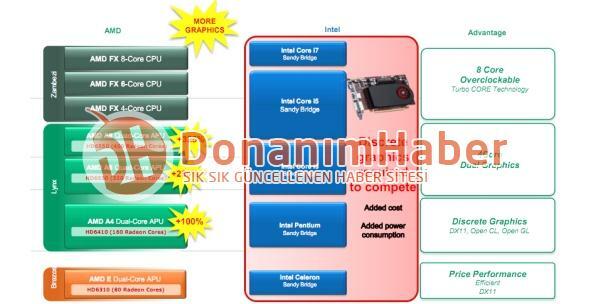 The A8 and A6 APU’s are Quad Core variants with the A4 being Dual Core, All chips will most likely feature Turbo Core Technology with which the GPU will be able to boost its core clock speed for better performance during high usage while consuming not more than 20W.